What to do when speckles occur on mushroom caps? 1. 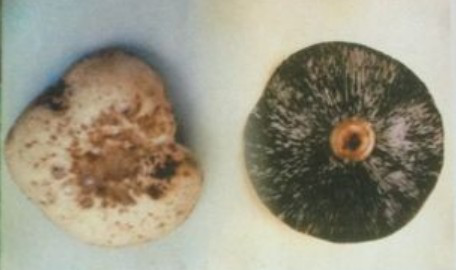 Symptom: In early stage, surface of contaminated mushroom cap shows the irregularity, then round or irregular speckles occur. In serious condition, speckles destructively spread over the caps. Under high-humidity environment, white sporocarps grow on contaminated mushrooms, in severe cases, gills stick together. 2. Route of propagation and condition of occurrence: In general, this kind of disease is brought into mushroom house through earthing, and it is propagated through the airflow. It easily happens when relative air humidity of mushroom house is at above 95%. 3. Ways of prevention and control: After growers find this kind of disease, be sure to enhance the ventilation of mushroom house, lower the humidity so as to cut off its propagation. Secondly, timely get rid of the contaminated mushrooms. And, in early contamination stage, spray 50%, 500 times of Carbendazol Wettable Powder, 600 times of Sulfur Suspension, 70%, 600 times of Methyl Thiobacillus Wettable Powder.